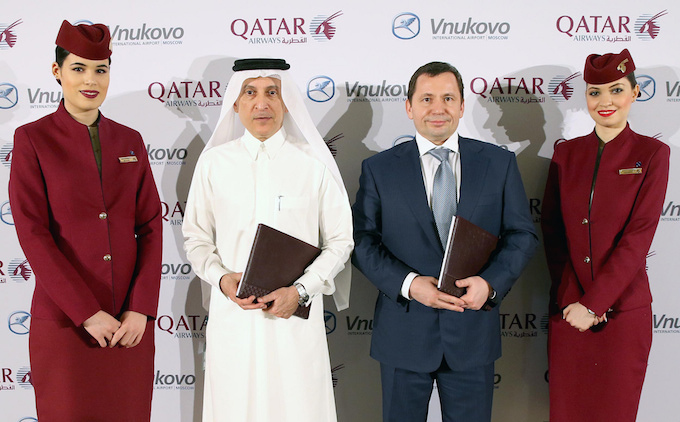 Qatar Airways has entered into a Memorandum of Understanding (MoU) with Vnukovo International Airport in Moscow, Russia’s third-largest airport, to potentially acquire up to 25 per cent of the airport’s total shares. The move will strengthen the airline’s foothold in Russia as well as improve ties and links between the two nations – boosting travel and tourism in the process. The signing ceremony took place on 4 April at the Oryx Rotana Hotel in Doha. His Excellency Akbar Al Baker, Qatar Airways Group chief executive, signed the MoU along with Vitaly Vantsev, chairman of the Board of Vnukovo International Airport. Al Baker, said: “As we celebrate the Year of Culture between Russia and the State of Qatar, I am very pleased to announce the potential acquisition of up to 25 per cent of Moscow’s Vnukovo International Airport. “Such an investment will complement the strong ties we have already established with the country, with our launch of direct services to St. Petersburg late last year, as well as our triple-daily flights to Moscow. Vantsev said the provisions of the MoU, once implemented, would establish foundations for a productive partnership between the airline and the airport. “Vnukovo International boasts the best transport accessibility and most advanced, cutting-edge airport infrastructure in Russia, enabling the airport’s consistently impressive passenger growth performance nationwide,” he added. This potential investment supports the airline’s investment strategy, which already includes 20 per cent investment in International Airlines Group, 10 per cent investment in LATAM Airlines Group, 9.94 per cent investment in Cathay Pacific and 49 per cent investment in Air Italy.